All cells are capable of some sort of movement. However, there are certain cell types whose dominant function is to generate force. Muscle tissues are composed of cells specialized for the optimal use of contractility. They are responsible for the movement of the body and its parts, as well as the changes in the size and shape of internal organs. All muscle tissues consist of elongated cells termed fibers. Their cytoplasm is called the sarcoplasm, and the surrounding cell membrane is known as either the plasmalemma or the sarcolemma. Numerous myofibrils can be found in the sarcoplasm of each muscle fiber. They contain two types of contractile protein filaments: actin and myosin. Despite all the structural and functional similarities between muscle tissues, there are also some differences. The human body contains three types of muscles: skeletal muscle, cardiac muscle, and smooth muscle. Skeletal muscles are attached to bone and are voluntary muscles. They are comprised of elongated cylindrical, multinucleated cells, known as muscle fibers. Each muscle fiber is formed by subunits called myofibrils that extend along the fiber’s length. Myofibrils, in turn, are comprised of myofilaments formed by actin and myosin proteins. Skeletal muscles have a regular, cross-striated pattern due to the distinct arrangement of the myofilaments, as a result, skeletal muscles are known as striated muscle. Under a light microscope, light I bands and dark A bands can be seen in each muscle fiber. The electron microscope further shows dense transverse lines called Z lines bisecting each light I band. The sarcomere is found between two adjacent Z lines. Sarcomeres are the smallest repeating contractile units present along the entire length of each myofibril. They are a characteristic feature in the sarcoplasm of both skeletal and cardiac muscle fibers. Individual muscle fibers are surrounded by endomysium, a thin layer of reticular connective tissue and are grouped into elongated bundles termed fascicles. Each fascicle is enclosed by a layer of loose collagenous tissue called the perimysium. The skeletal muscle mass is surrounded by a dense, irregular collagenous sheath termed the epimysium. Blood vessels, nerves, and lymphatics are located within these different sheaths of connective tissue. Neuromuscular spindles are present in most skeletal muscle. They consist of a connective capsule that contains modified muscle fibers called intrafusal fibers, as well as numerous nerve endings. The neuromuscular spindles are responsible for monitoring the changes in muscle length and the activation of complex muscle reflexes to regulate muscle activity. Cardiac muscles are primarily found in the walls and septa of the heart and the large vessels attached to it. Like skeletal muscles, cardiac muscle fibers are cylindrical in shape, have a distinct cross-striated pattern, and reveal similar A and I bands, Z lines, and repeating sarcomere units. 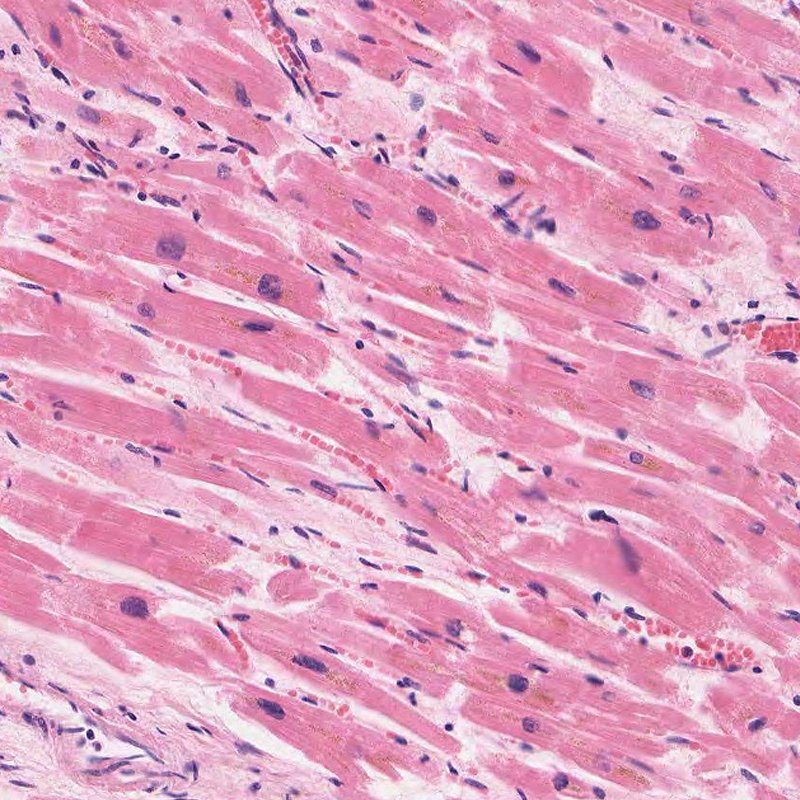 However, cardiac muscle fibers are unique in that they are shorter, branched, and exhibit only one or two central nuclei. Intercalated disks are characteristic end-to-end junctional complexes that are present in the terminal ends of adjacent cardiac muscle fibers. They contain gap junctions that enable ionic continuity between adjacent cardiac cells, acting as electrical synapses that allow contraction signals to pass as waves from cell to cell. Smooth muscles are widely distributed throughout the body, and can be found in numerous visceral hollow organs and blood vessels. Their muscle fibers contain both actin and myosin filaments, however, they are not arranged in the regular cross-striated pattern seen in skeletal and cardiac muscle fibers. Hence, these muscle fibers are considered as smooth or non-striated. Moreover, they are considered as involuntary muscles, acting under the control of the autonomic nervous system and hormones. Smooth muscle fibers are small and spindle-shaped. They contain a single central nucleus, and are each surrounded by connective tissue and muscle layers. In the digestive tracts, uterus, ureters, and other hollow organs, smooth muscles occur in large sheets. In blood vessels, they are arranged in a circular pattern that permits them to control blood flow by changing luminal diameter. Want to learn more about the Muscle tissue?